Lace Ornament Covers Add a little luxury to Christmas tree bulbs with elegant lace ornament covers. Add beads, ribbon, and baubles for a stylish and sophisticated effect. Click here to see them all! This video tutorial shows how theyâ&#x20AC;&#x2122;re made. Watch to master this elegant style of embroidery. Elevate your Christmas tree with beautiful filigree ornaments. The colorful ornaments are made right in the hoop, and use fiberfill for extra depth and dimension. Stitch the whole collection to transform your tree. Click here to see them all! Light and Lacy Christmas Lace Christmas tree decorations are as fabulously indulgent as they are beautiful. And, theyâ&#x20AC;&#x2122;re surprisingly easy to make, too! Simply follow our steps in the Embroidering Freestanding Lace video to learn the basics for making this beautiful type of embroidery, then use your newfound knowledge to bring these embroidery designs to life. 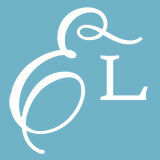 Watch the Freestanding Lace Video! Gather â&#x20AC;&#x2122;Round the Christmas Tree Set the stage for gift-opening on Christmas morning with a festive homemade tree skirt. Your tree will look fabulous with one of these skirts laying under its boughs! Free project tutorials demonstrate how to make the stunning skirts. Start a treasured tradition with timeless in-the-hoop ornaments. With dozens and dozens available, you and your family members can pick your favorites to add to your tree year after year. Click here to see them all! Candy Cane Holders Add a sweet look to your tree with these in-the-hoop candy cane holders. Simply slip the striped treats into the adorable holders as shown in the image below, and hang on your tree for a tasty Christmas ornament. Make a special statement this holiday by adding stunning 3D lace designs to your Christmas tree. Each of these ornaments have been specially digitized to look beautiful from any angle. Click here to see them all! Battenburg Lace Delicate Battenburg lace is stitched using cotton thread to replicate a classic, hand-crafted look. These light and lovely ornaments are made from the special type of lace, and add a joyful look to your tree. Lace Christmas Tree If you canâ&#x20AC;&#x2122;t fit a Christmas tree in your home, or are simply looking for another way to brighten your space for the holidays, try this sophisticated lace Christmas tree. 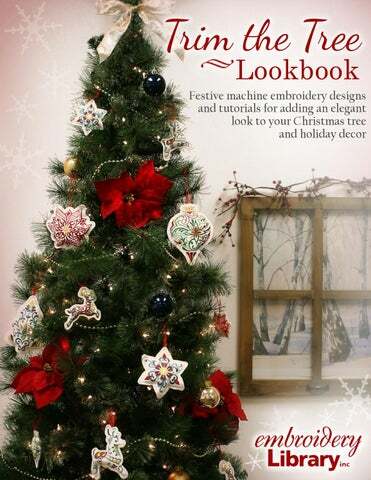 Machine embroidery designs and inspiration for trimming your Christmas tree.